Microglial activation is known to cause inflammation resulting in neurotoxicity in several neurological diseases. N-((3,4-Dihydro-2H-benzo[h]chromene-2-yl)methyl)-4-methoxyaniline (BL-M), a chromene derivative, was originally synthesized with the perspective of inhibiting nuclear factor-kappa B (NF-κB), a key regulator of inflammation. The present study evaluated the antioxidant and anti-inflammatory potential of BL-M in lipopolysaccharide (LPS)-stimulated BV2 microglial cells. Our results demonstrated that BL-M significantly inhibited the formation of 1,1-diphenyl-2-picrylhydrazyl radicals, as well as lipid peroxidation in rat brain homogenate in a concentration-dependent manner. In addition, it suppressed the generation of intracellular reactive oxygen species, and the levels of pro-inflammatory mediators including nitric oxide, tumor necrosis factor-α, and interleukin-6 in LPS-induced BV2 cells. 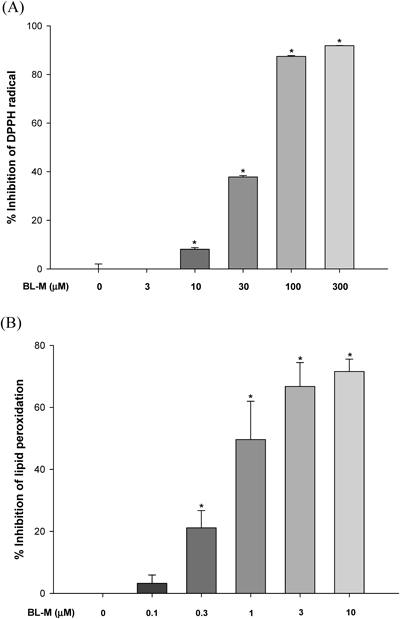 Western blotting analyses revealed the inhibition of inhibitor of kappa B alpha (IκBα) phosphorylation and NF-κB translocation by BL-M in LPS-activated cells. Therefore, our study highlights marked antioxidant and anti-inflammatory activities of BL-M, and suggests that this compound may have a beneficial impact on various neurodegenerative diseases associated with inflammation. Microglia represent one of the vital components of the brain immune system.1) Upon activation they undergo morphological changes and release a number of cytotoxic factors such as inflammatory mediators and cytokines, and reactive oxygen species (ROS). The excess production of these agents plays a crucial role in triggering neurotoxicity leading to an initiation of a self-propagating cycle of neuronal death.2) Among several inducers, lipopolysaccharide (LPS) is known to activate microglial cells through its binding to toll-like receptor 4 (TLR4) receptors,3) which induces translocation of nuclear factor-kappa B (NF-κB) to the nucleus, and ultimately leads to the transcription of several cytotoxic inflammatory mediators. LPS also induces the production of ROS in microglia, which contributes to the oxidative stress accompanying the inflammatory process.2) Therefore, LPS-induced microglial inflammation could serve as an important model for the evaluation of potential therapeutic agents in the prevention of the progression of neuronal cell death leading to neurodegenerative disorders. 2H-Chromene (2H-benzopyran) represents a large class of compounds with diverse pharmacological properties including antioxidant, anti-inflammatory and neuroprotective activities.4) Recently, it has been found that, N-((3,4-dihydro-2H-benzo[h]chromene-2-yl)methyl)-4-methoxyaniline (BL-M), a synthetic chromene derivative, possesses anti-inflammatory properties in terms of its ability to inhibit LPS-induced NF-κB transcriptional activity in RAW264.7 macrophage cells.5) However, the antioxidant and anti-inflammatory activities of this compound in microglial cells has not yet been studied. In the present study, we investigated the protective effect of BL-M against inflammatory and oxidative insults in LPS-induced BV2 microglial cells, which is widely used as a model for neuroinflammation. BL-M (Fig. 1) was synthesized from 1-(1-hydroxynaphthalen-2-yl)ethanone through a series of reactions as previously described.5) The final BL-M compound was purified by flash column chromatography (ethyl acetate/hexanes). Thin layer chromatography was performed on E Merck silica gel GF-254 pre-coated plates, and only a single spot was identified under UV illumination. The compound was further identified by IR, 1H-NMR, 13C-NMR and mass spectra (for detail information, see Supplementary materials). All the spectroscopic data warrant the purity of the compound. The BV2 microglial cells were cultured in Dulbecco’s modified Eagle’s medium (DMEM) supplemented with 10% fetal bovine serum (FBS) and 1% antibiotics at 37°C in the presence of 5% CO2. The cells were co-treated with 1 µg/mL LPS and indicated concentrations of BL-M in serum-free media for the desired time periods. The cell viability was measured by 3-(4,5-dimethylthiazol-2-yl)-2,5-diphenyltetrazolium bromide (MTT) assay. The levels of nitric oxide (NO), tumor necrosis factor-α (TNF-α), and interleukin-6 (IL-6) in cell supernatant media and intracellular ROS were determined using appropriate commercial reagents or kits. Western blotting analyses with antibodies recognizing phosphorylated inhibitor of kappa B alpha (IκBα) and p65 subunit of NF-κB were performed according to the standard protocols. The cell culture procedure, treatment schedule, experimental methods, and statistical analysis are described in detail in Supplementary materials. We first tested the DPPH radical scavenging activity of BL-M, and found that it exhibited mild scavenging activity (approximately 40% inhibition) at the concentration of 30 µM (Fig. 2A). As we increased its concentration up to 300 µM, BL-M exerted marked inhibition (>90% inhibition) of the DPPH radicals. From these data, the IC50 value was calculated to be 38.62 µM. The effect of BL-M on the LPO induced by Fe2+ and L-ascorbic acid in rat brain homogenates was more dramatic and potent (Fig. 2B). It exhibited significant inhibition of LPO (ca. 20% inhibition) at the concentration as low as 0.3 µM. The inhibition was more prominent as we increased the concentration of BL-M, reaching almost 80% inhibition at 10 µM concentration. The estimated IC50 value was 1.49 µM. Values are expressed as the mean±S.E.M. of three independent experiments performed in quartet. * p<0.05 compared to the control. 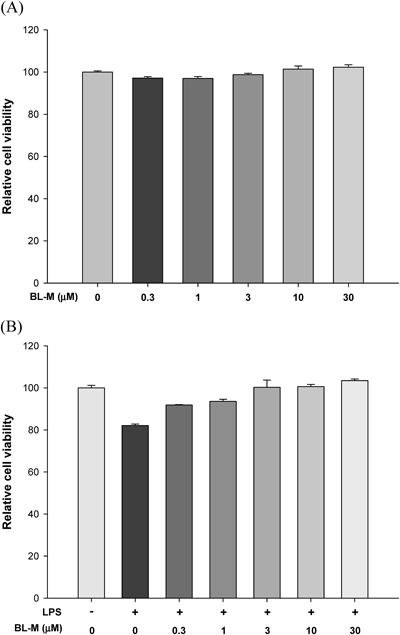 To examine whether BL-M causes any cytotoxicity in BV2 cells, the cells were exposed to various concentrations of BL-M for 24 h and the cell viability was measured by MTT assay. We found that BL-M did not produce any cytotoxicity in BV2 cells at the concentrations ranging from 0.3 to 30 µM (Fig. 3A). No mortality of cells was also observed when they were treated with LPS in combination of BL-M for 24 h (Fig. 3B). Based on these observations, the effects of BL-M on the LPS-treated cells were tested up to 30 µM in this study. Data represent the mean±S.E.M. of three independent experiments performed in quartet. We next examined the effects of BL-M on LPS-induced production of intracellular ROS and inflammatory mediators in BV2 cells. The cells treated with LPS for 24 h caused 1.7-fold increase in the intracellular ROS, which was inhibited by BL-M almost to the control level at 30 µM concentration (Fig. 4A). Moreover, the LPS treatment of the cells induced dramatic increases in the production of NO, TNF-α and IL-6 (Figs. 4B–D). These LPS-induced mediators were concentration-dependently and significantly reduced by the co-treatment with BL-M at the concentrations of 10 and 30 µM (Figs. 4B–D). Data represent the mean±S.E.M. of three independent experiments performed in quartet. # p<0.05, * p<0.05 compared to control and LPS-treated cells, respectively. To elucidate the action mechanism by which BL-M inhibited LPS-induced production of the inflammatory mediators, we investigated its effect on nuclear translocation of NF-κB. Our results showed that the LPS treatment of BV2 cells for 1 h caused a marked phosphorylation of IκBα. The LPS-induced phosphorylation of IκBα was significantly inhibited by BL-M at both 10 and 30 µM concentrations (Fig. 5A). In parallel, our Western blotting analyses demonstrated that LPS treatment of the cells induced nuclear translocation of NF-κB, and that BL-M inhibited the LPS-induced NF-κB translocation (Figs. 5B, C). β-Actin was used for normalization of phosphorylated IκBα and cytosolic NF-κB p65, and Lamin B1 was used for normalization of nuclear NF-κB. The quantitative data were depicted as the mean±S.E.M. from three independent experiments. # p<0.05 and * p<0.05 compared to control and LPS-treated cells, respectively. The above findings prompted us to evaluate the anti-inflammatory impact of BL-M in BV2 cells stimulated with LPS. It has been found that LPS activates NF-κB, which in turn results in the release of several inflammatory mediators including NO, TNF-α, and IL-6 that play a crucial role in the inflammatory responses.9) NO has been demonstrated to be an active messenger and effector in the immune and nervous systems, and an elevation in the level of this mediator contributes to nitrative stress leading to the injury of neuronal cells.10) TNF-α promotes neuronal cell death, both directly and indirectly, via the stimulation of NO and the production of free radicals in activated microglial cells, which are subsequently released into the surrounding environment.10) Using transgenic mice overexpressing IL-6, it has been postulated that this cytokine may have a direct pathogenic role in inflammatory and neurodegenerative central nervous system (CNS) diseases.11) In keeping with our earlier observation in BV2 cells demonstrating complete inhibition of LPS-induced ROS production (Fig. 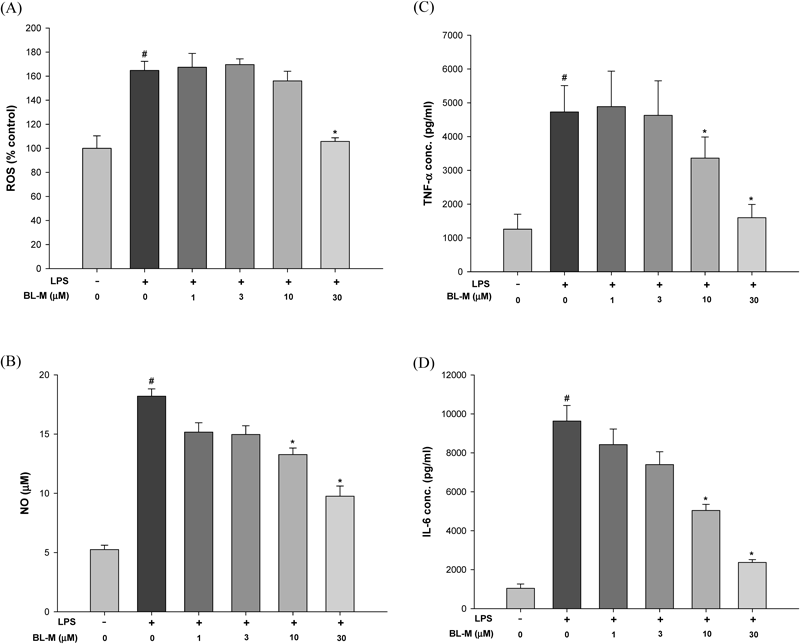 4A), BL-M suppressed the LPS-induced production of NO, TNF-α, and IL-6 in concentration-dependent manners, significantly and dramatically at 10 and 30 µM (Figs. 4B–D). NF-κB, a key player in inflammation, is a member of the Rel family of transcription factors. Under normal cellular conditions, it resides in the cytoplasm, forming a complex with its inhibitor IκB. Upon activation with an appropriate inducer like LPS, the inhibitory protein IκB becomes phosphorylated and degraded, allowing nuclear translocation of NF-κB, which induces the transcription of different inflammatory mediators.10) Our findings from Western blotting analyses revealed that BL-M significantly inhibited the LPS-induced phosphorylation of IκBα and subsequently inhibited the nuclear translocation of NF-κB. These results indicate that suppression of the nuclear translocation of NF-κB may account for the observed anti-inflammatory activities of BL-M. In conclusion, BL-M demonstrated appreciable antioxidant properties as evident by its inhibitory effects on DPPH radicals, ROS, and LPO. In parallel, it also exhibited anti-inflammatory activities as reflected by the suppression of different pro-inflammatory mediators in BV2 cells, probably through the inhibition of NF-κB. Based on these results and previous literature, it is also conceivable that the antioxidant properties of BL-M may contribute to its anti-inflammatory activities. Taken together, our results highlight that BL-M can be utilized as a lead compound to optimize or improve anti-inflammatory activities which may be beneficial for various types of neurodegenerative diseases associated with inflammation. This research was supported by the Basic Science Research Program through the National Research Foundation (NRF) of Korea, funded by the Ministry of Education, Science and Technology (NRF-2013R1A1A2009381) and the GRRC program of Gyeonggi province (GRRC-DONGGUK 2015-B01). 1) Barron KD. The microglial cell. A historical review. J. Neurol. Sci., 134 (Suppl. ), 57–68 (1995). 2) Block ML, Hong JS. Microglia and inflammation mediated neurodegeneration: multiple triggers with a common mechanism. Prog. Neurobiol., 76, 77–98 (2005). 3) Lehnardt S, Massillon L, Follett P, Jensen FE, Ratan R, Rosenberg PA, Volpe JJ, Vartanian T. Activation of innate immunity in the CNS triggers neurodegeneration through a Toll-like receptor 4-dependent pathway. Proc. Natl. Acad. Sci. U.S.A., 100, 8514–8519 (2003). 4) Venugopala KN, Rashmi V, Odhav B. Review on natural coumarin lead compounds for their pharmacological activity. BioMed Res. Int., 2013, 963248 (2013). 5) Choi M, Hwang Y, Kumar AS, Jo H, Jeong Y, Oh Y, Lee J, Yun J, Kim Y, Han S, Jung J, Cho J, Lee H. Design and synthesis of 3,4-dihydro-2H-benzo[h]chromene derivatives as potential NF-κB inhibitors. Bioorg. Med. Chem. Lett., 24, 2404–2407 (2014). 6) Cho J, Lee HK. Wogonin inhibits excitotoxic and oxidative neuronal damage in primary cultured rat cortical cells. Eur. J. Pharmacol., 485, 105–110 (2004). 7) Closa D, Folch-Puy E. Oxygen free radicals and the systemic inflammatory response. IUBMB Life, 56, 185–191 (2004). 8) Geronikaki AA, Gavalas AM. Antioxidants and inflammatory disease: synthetic and natural antioxidants with anti-inflammatory activity. Comb. Chem. High Throughput Screen., 9, 425–442 (2006). 9) Park JS, Woo MS, Kim DH, Hyun JW, Kim WK, Lee JC, Kim HS. Anti-inflammatory mechanisms of isoflavone metabolites in lipopolysaccharide-stimulated microglial cells. J. Pharmacol. Exp. Ther., 320, 1237–1245 (2007). 10) Kim EA, Han AR, Choi J, Ahn JY, Choi SY, Cho SW. Anti-inflammatory mechanisms of N-adamantyl-4-methylthiazol-2-amine in lipopolysaccharide-stimulated BV-2 microglial cells. Int. Immunopharmacol., 22, 73–83 (2014). 11) Campbell IL, Abraham CR, Masliah E, Kemper P, Inglis JD, Oldstone MB, Mucke L. Neurologic diseases induced in transgenic mice by cerebral overexpression of interleukin 6. Proc. Natl. Acad. Sci. U.S.A., 90, 10061–10065 (1993).